Across southwest Kansas, native grasses and wildflowers are thriving in a sea of green and yellow blooms. Wild sunflowers fill the rolling hills, and sagebrush provides shelter for many species of animals. The loud call of cicadas looking for a mate ring across the prairie, and all sorts of birds fly through the air looking for insects to eat. The prairie is alive this year, and it is because of the unusually large amount of rain. 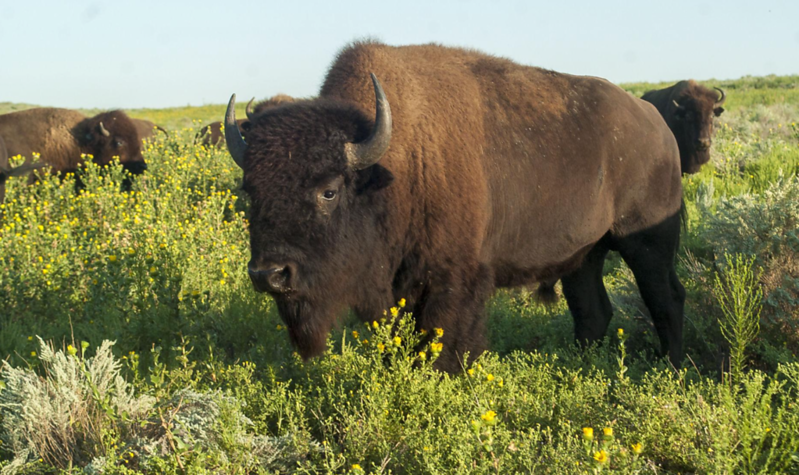 The Sandsage Bison Range, a large stretch of untamed prairie south of Garden City, is overflowing with wildflowers and insects. Kurtis Meier, district wildlife biologist for southwest Kansas, says that the ecosystem in the area depends greatly on moisture levels. According to the National Weather Service in Dodge City, Garden City has had 19.65 inches of rain so far this year, 4.43 higher than the average for this time of year. The insect population boom was evident recently on a driving tour of the range. Meier drove a pickup along a service road cutting through the range, and hundreds of grasshoppers clung to the outside of the vehicle. Mississippi kites, small birds that enjoy diets of insects, chased the truck, flying low to the ground to eat any insects that flew out of the path of the vehicle. One of their favorite foods, cicadas, is abundant in years of rain. The insects also feed a large quail and pheasant population, which are popular with hunters. Meier said he expects a larger-than-normal pheasant population when hunting season comes. About 50 miles north of Garden City at Lake Scott State Park, park ranger Phil Gould said they have not been as lucky with the rain. Scott City, about 15 miles south of the park, reports 15.25 inches of rain so far this year, .49 inches lower than the year-to-date average. A sign at the entrance of the park warns of extreme fire danger, warning campers to be careful. It’s important to be on watch for wild fires, because Lake Scott is expecting up to 7,000 visitors to the park during the Labor Day weekend. Lake Scott acts as an oasis to the area, because no matter how little rain falls, water comes from below ground. The only real threat to the water level is when nearby farmers pump too much water to irrigate their crops. Even then, the lake is stable, being a frequent stop for migratory birds flying south for the winter. Currently, a large population of turkey vultures have stopped at Lake Scott, making their way across Kansas. Farther east at Cedar Bluff State Park, park manager Steve Seibel said that although Kansas has had a lot of rain, the region around the park could use more. Cedar Bluff has had more rain than the other two parks, with 23.09 inches falling so far. That is 6.02 inches more than the average for this time. Like Sandsage, the wild grasses at Cedar Bluff seem to be thriving. These healthy grasses have led to a stronger population of pheasant, and Seibel said he has seen double the numbers from past years. The health of the prairie may not seem important to some residents of southwestern Kansas, but it still can affect residents in the cities.